Wet n Wild Photo Focus Foundation in Buff Bisque ~ $7.97 CAN. Specially made with a matte, light-diffusing complex to give your skin #nofilter perfection. This foundation made my Monthly Favourites in January; but, I will be honest in that I didn't fall in love with this immediately. It looks amazing on this skin applied with a dense, flat foundation brush - not with a sponge! This is so good and it's so affordable - I can finally see what all the hype was about! If you want to see it on me, you can see it in a look here! Tatcha Luminous Dewy Skin Mist ~ $24.00 CAN for mini size shown (full size is $59.00 CAN). A silky, fine mist moisturizer that can be used under or over makeup for dewy glowing skin anytime, anywhere. Do you have a product that you loved before and saved a tiny bit of it because you were worried about finishing it?! That is this - 2 years ago I loved this product and featured it in a Go-to Makeup Look, so I really liked it. But, I used it one last time and it left dewy spots all over my face, which isn't an amazing portrayal of the product for one last time. I did like this. Becca Backlight Priming Filter ~ $47.00. CAN A makeup primer to help blur imperfections and impart a radiant glow. Full sized primers actually take forever to get through - this primer actually made my favorites in November 2016 and you may have noticed it featured in a ton of my recent makeup looks; because as much as I like it, I really wanted to finish it and not waste it as it was getting up there in age! It's a nice glowy primer that looks good on! Too Faced Peach Perfect in Vanilla ~ $45.00 CAN. A transfer-resistant, medium-coverage foundation that creates a smooth canvas for flawless, comfortable, matte wear that is never cakey or mask-like. This foundation was pretty good - I liked it; but, I certainly didn't love this. It was medium coverage; but, I found it wasn't super long wearing and would break up on my nose. I also didn't think it was transfer-resistant. Good; but, not great for me. Model in a Bottle Makeup Setting Spray Matte Finish ~ $19.95 US. Our Model in a Bottle Original Makeup Setting Spray is the one that started it all. I probably shouldn't even say how old this setting spray - it's old. But, it's a very strong alcoholy primer, so I only used when I needed to layer makeup and primers so that my makeup wouldn't move at all (think August beach wedding). So this was effective, but overall to alcoholy and your face wouldn't move well while you used it. Stila Glitter & Glow Liquid Eye Shadow in "Kitten Karma" ~ deluxe sample shown here (full size is $31.00 CAN). A brilliant long-wearing liquid glitter eyeshadow. I love these Stila glitter shadows so much - this one in particular made my October 2017 Favorites and a set of 3 also made my top products of All of 2017! This was gorgeous and looked amazing on the eyes. This was a little dried up; but, also pretty used up so it was okay to say good-bye to it now! The Balm Mary-Lou Manizer Highlighter and Shadow ~ sample size shown (full size is $24.00 US). Trust us, this champagne luminizer is so gorgeous, it’s criminal. This is another product that has been around forever - this made my Favorites back in November 2015! It's a beautiful, light champagne highlighter that was very flattering on my skin tone! Thursday Plantation Tea Tree Face Wash Foam ~ $14.99 CAN. The naturally derived cleanser captures the antibacterial power of Tea Tree Oil to gently remove sebum excess, dirt and makeup without stripping the skin of its natural oils. This was good - I always use a foaming cleanser as a second cleanser after an oil cleanser. I didn't think that this was as drying as other tea tree foaming cleansers I have used. Overall, good. L'Oreal Paris Gentle Eye Makeup Remover ~ $9.27 CAN. Specially created to remove waterproof and long lasting makeup quickly and easily without leaving a greasy film. This says that it's not supposed to leave a greasy film; but, that's pretty much exactly what it did... it was so oily and greasy that you were supposed to mix it up. It worked to remove the makeup, but it really did leave an oily layer on my eyes. Glow Recipe Watermelon Glow Pink Juice Moisturizer ~ mini size shown is $28.00 CAN (full size is $50.00 CAN). A lightweight moisturizer, ideal for oily to combination skin, that is formulated with vitamin-rich watermelon extract, hydrating hyaluronic acid, and soothing botanicals to boost radiance and glow. Skinfood Gummy Bear Jelly Hand Gel in Kiwi ~ $10.85 CAN. A citrus kiwi scented hand gel that nourishes and keeps hands moisturized. This is such an adorable package - it's a little gummy bear! But, it's actually really small that it's kind of crazy to spend $10 on it! I had to try it and it's a gel; but, it was not hydrating enough for my hands! Cosrx Acne Pimple Master Patch ~ $7.25 CAN (prices vary by website). Acne Pimple Master Patch heals acne, blemishes and prevents future breakouts quickly. These are a holy grail in my collection - these made my favorites all the way back in September 2015! These clear up acne so well and so quickly! Zoella Beauty "Soak Opera" - Bath Soak and Shower Cream ~ $10.99 CAN. A delicately fragranced 'beauty in a bottle' bath soak to calm the senses with soothing floral notes. This is a huge bottle of bubble bath and it was fine - always super bubbly. The scent was good but after a year or so of the same floral scent, I can't say I loved it at the end! But, was a good product. Biolage R.A.W. Uplift Shampoo ~ $25.00 CAN. Biolage R.A.W. Uplift Shampoo, with black sesame and grapefruit, purifies flat, fine hair without stripping for lightweight body. Biolage R.A.W. Uplift Conditioner ~ $25.00 CAN. Biolage R.A.W. Uplift Conditioner with kiwi and kaolin clay, weightlessly conditions flat, fine hair for increased body. I didn't think I minded this shampoo and conditioner; but, I just couldn't get it too work for my hair. Or honestly, maybe it was that it worked too well - it cleaned the crap out of my hair and then just made it super greasy almost immediately. I don't know - I just could not get them to work for me and I tried quite a few times! Clear Care Plus Cleaning and Disinfecting Solution ~ $19.97 CAN. Not only does CLEAR CARE® PLUS Cleaning and Disinfecting Solution clean and disinfect your contact lenses with the bubbling power of hydrogen peroxide, it also surrounds your lenses with long-lasting moisture. This is a great contact solution - I switched to a hydrogen peroxide solution a year ago (with only one mishap of not letting it rinse long enough). This is at least a 6 hour solution; but, it's great! Much better at cleaning than regular solutions! Essenza Hand Soap and Lotion ~ $? This set is so old - I've refilled the soap multiple times; but, we've finally finished this lotion after 5 years of being in our guest bathroom. Neither was a stand out for me. Dr. Squatch Cedar Citrus Soap ~ $7.00 US. Even the toughest Squatch guys have a soft side. That’s why we we’ve created this refreshing blend of rustic cedar wood and zesty orange oils, to strike a perfect balance between strength and suppleness. My husband loves this brand of soap, and it's a little hard to find in Canada so I usually pick up a whole bunch for Christmas and his birthday. Anyways, he enjoyed this kind. Aveeno Baby Eczema Care Moisturizing Cream ~ $11.47 CAN. This patented Triple Oat formula soothes and moisturizes to help care for your baby’s delicate skin with eczema. This worked really well on Elliott's super dry skin all Winter and Spring! It was comfortable on my skin as well and I would recommend this for babies with eczema or really dry skin! Exact Soft & Smooth Dental Floss Picks ~ $? Nothing special; but, I'm a lazy flosser so I love these picks - they actually make my family floss. Neutrogena All-in-One Duo Make-Up Removing Cleansing Wipes ~ $20.99 CAN for a 2 pack of 25 wipes. NEUTROGENA® All-in-One Makeup Removing Cleansing Wipes are soft pre-moistened wipes that gently dissolve all traces of dirt, oil, and make-up to give you fresh, clean skin in one step. These wipes were fine - they did the trick and removed my makeup (I generally use more for swatches than makeup removal); but, these are on the expensive side for just being okay. 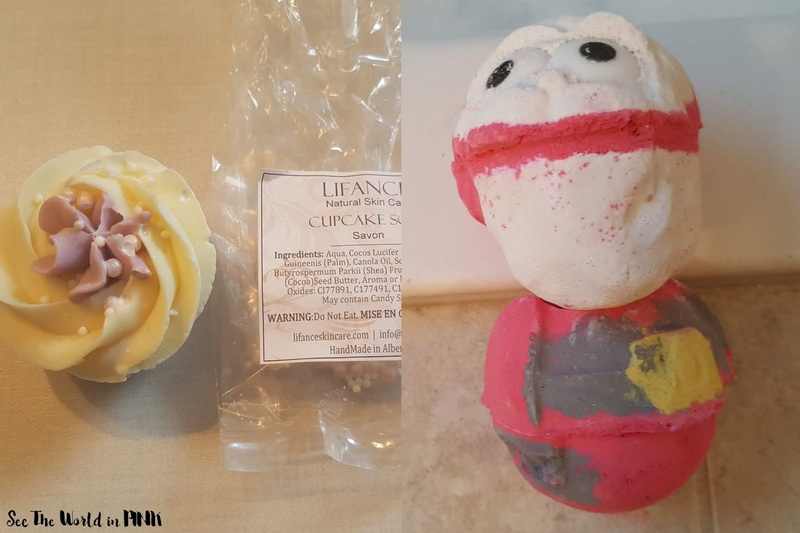 Lifance Cupcake Soap ~ $? This was a cute little soap - it was fine, moisturizing on the skin. It looks like this brand has re-done their products and are no longer making soap. But, it did the trick. Lush Santa Bomb Bomb ~ $9.95 CAN. Whether you choose to use one half and save the other for another day or use them both at once, Santa's sleigh is packed with a spicy-sweet blend of cocoa, vanilla and bergamot. Yes, it was March and I'm just getting in to my Christmas goodies. I've been trying to use my older products first. This is adorable and I love that it was 2 baths worth! It smelled great and made the bath bright red! So, in March I used up 24 products! I'm super impressed with how many makeup products I used up this month - it always feels like an accomplishment to finish products; but, especially to finish a whole makeup product up! 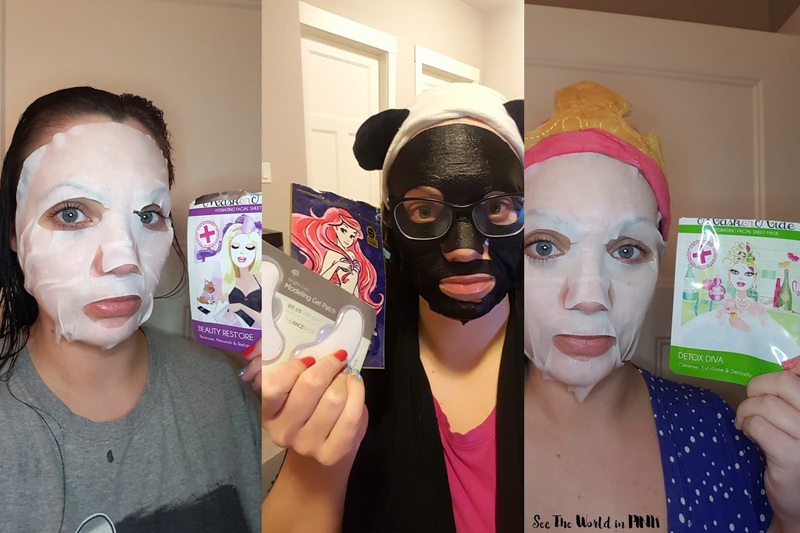 ToGoSpa Bamboo Charcoal FACE Collagen Gel Masks ~ $25.00 for 3 masks. Bamboo Charcoal- The Purifier. Absorb impurities and detoxify the skin, formulated for Oily and Acne prone skin. Face by ToGoSpa Micro-Infused Collagen Gel Masks with Hyaluronic Acid, Vitamins C & E will hydrate, brighten and smooth your FACE. This mask fits quite huge - you really can't do anything while you are wearing, so make sure you have the time to lie down and wear this. I've done a whole review on this mask a long time ago, you can check it out here. This was fine; but, the fit made me not enjoy it and it was just okay for me. There is a couple of these bio-cell masks on the Face Shop; but, I don't see this kind anymore. This lasted about 15 minutes on me; but, I love the biocellulose material and it really delivered results. I really liked this. Bit of a bummer that it's not available anymore (online at least, I can't speak to in store). Lovemore x Disney Tsum Tsum Art Mask - Toy Story Lotso ~ $5.00 CAN. Soothing, Refreshing, Balancing Oil Sebum, Oil Control, Moisturizing. This mask was for oil control; but, really I used it for the adorable packaging! I've reviewed a couple of these in the past - they were limited edition and not easy to find now. But, they are a little thicker of a material than I normally like to wear, but it did make my skin feel okay. TheFaceShop Bio-Cell Brightening Face Mask ~ $4.50 CAN. This brightening mask features a naturally adhesive bio-cellulose sheet and a hydrating serum containing Glutathione to give you a bright, healthy complexion. This was another really great and comfortable biocellulose mask - I always rave about this material, it's so comfortable. I found this one very gentle and effective on the skin. My skin looked and felt good after wearing this! MaskerAide Beauty Rest'ore Nourishing Sheet Mask ~ $6.00 CAN. While you prepare for your beauty sleep, our BEAUTY REST’ORE hydrating sheet mask goes to work for silky, smooth and supple skin by morning. I plan on reviewing these MaskerAide masks shortly, so I will keep my review here short and sweet! This material is a little thicker than I generally like; but, it did fit well so I was okay with the material. This wore for 20 minutes and was very cooling and relaxing on the face. It delivered results and was good! The Face Shop Bright Eyes Modeling Gel Patch ~ $6.00 CAN. Enjoy brightening effect and restore firmness around the delicate eye area with this amazing eye patch. I've been saving these for a little while and it was time to use them - these were nice and cooling (especially after storing them in the fridge). These were comfortable and adhered well too! I thought they were just okay with results. Sexylook Disney Princess Black Mask- Ariel ~ $3.00 US. This princess mask is enriched with vitamin C to boost circulation for radiant glowing skin. I really like these masks - they are so soaked essence and adhere so well to the face. I wore this for almost an hour and it was in the fridge before I used it it, so it was so cooling and refreshing to wear! It made my skin bright and clear! MaskerAide Detox Diva Detoxifying Sheet Mask ~ $6.00 CAN. Gone are the days of using harsh scrubs and drying clays. DETOX DIVA is here to protect you from toxins and free-radicals without removing your skin’s essential natural oils. This mask was well soaked in essence and I wore it for 20 minutes (I could have worn it longer; but, I generally don't want to wear detoxifying masks for too long!) It was clearing and refreshing on the skin and I really liked it! 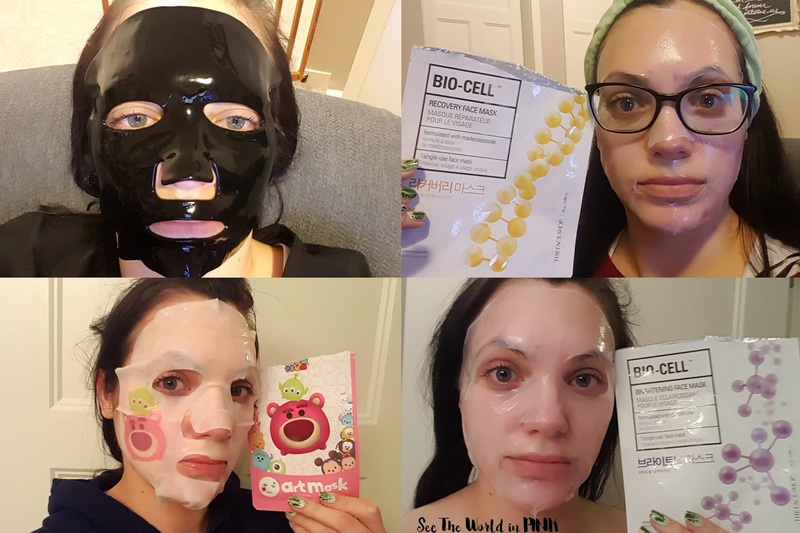 I also used the Miniso We Bare Bears Moisturizing & Glossy Eye Masks and the The Oozoo Bear Black Space Pore Caring Mask - I reviewed both of those masks this month! So, on top the products I used, I also used up 10 sheet masks too! Great post - it looks like you emptied a lot of products! I absolutely love that gummy bear packaging, too bad it wasn't hydrating enough :) Thanks for sharing! It's so awesome to finish this many products in a month!